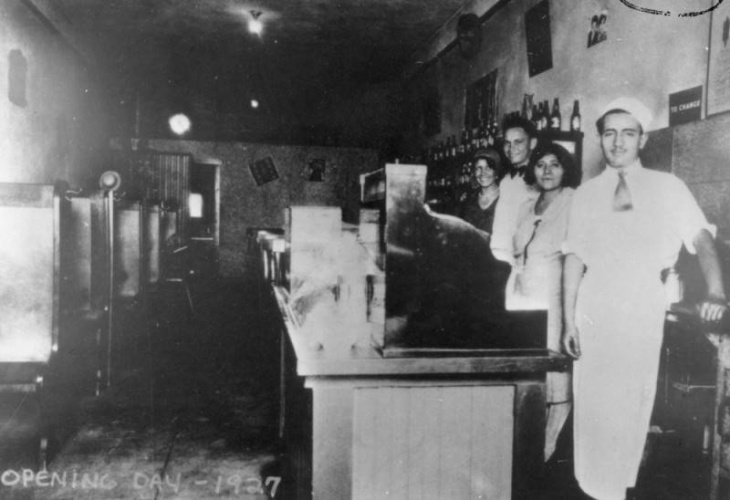 In 1923, beloved Mexican restaurant chain El Cholo opened the doors to its first establishment. To commemorate that tasty occasion, El Cholo will sell its best-selling item — the #1 combo plate, comprised of a cheese enchilada, a rolled beef taco, Spanish rice and refried beans — for 95 cents on Tuesday, Oct. 23, 2018. 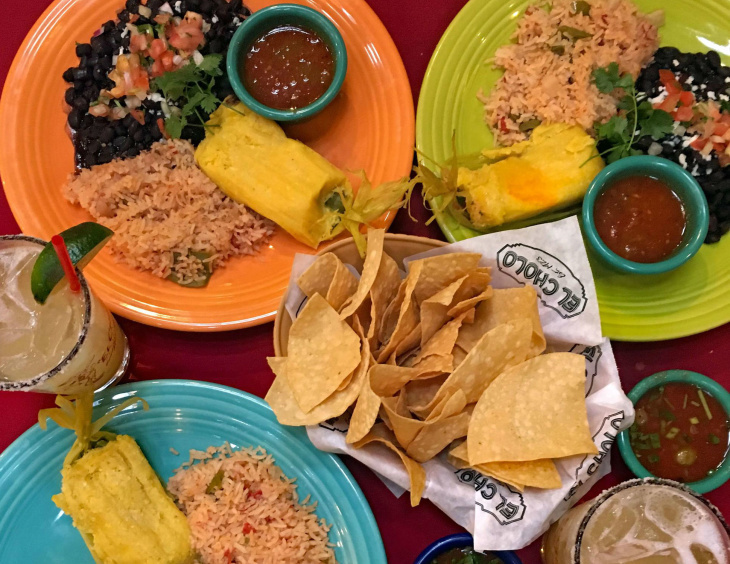 The deal is good all day and at all six El Cholo locations — downtown L.A., Koreatown, Santa Monica, La Habra, Anaheim Hills and Corona Del Mar — but it's limited to one combo per person. When the restaurant opened in 1923, it wasn't known as El Cholo. It was called the Sonora Café and it was located at Santa Barbara and Moneta avenues (now Martin Luther King Blvd. and Broadway), near the site where the L.A. Coliseum would later be built. Founders Alejandro and Rosa Borquez were a married couple. She was a native of Globe, Arizona. He was either a native of nearby Safford, Arizona or an immigrant from Mexico (accounts vary). Both had roots in the state of Sonora in northwestern Mexico and the food they served — enchiladas, tamales, albondigas, chile rellenos and "fried beans" — was rooted in Sonoran cuisine. A couple years later, a guest, while waiting for his dinner, sketched a figure of a man on the menu. He nicknamed him El Cholo, the term used by Spanish settlers in California for field hands, according to the restaurant's website. The Borquezes liked the drawing so much, they renamed the restaurant El Cholo in 1925. 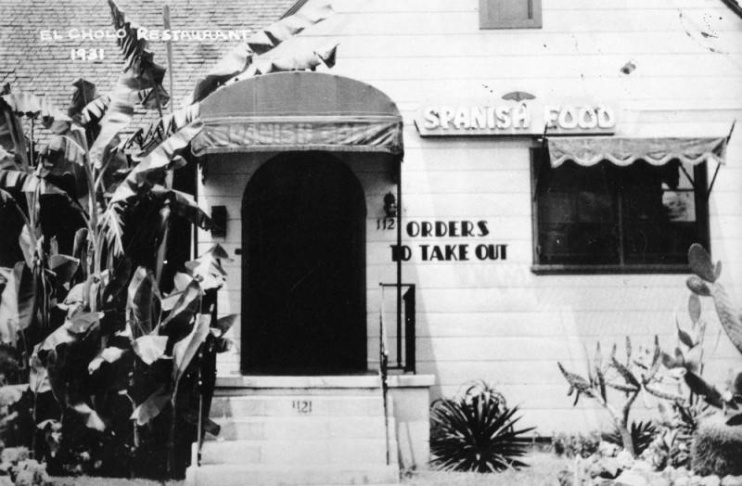 Two years after that, in 1927, their daughter, Aurelia Borquez Salisbury, and her husband, George Salisbury, opened their own El Cholo Café on Western Ave., in what is now Koreatown. 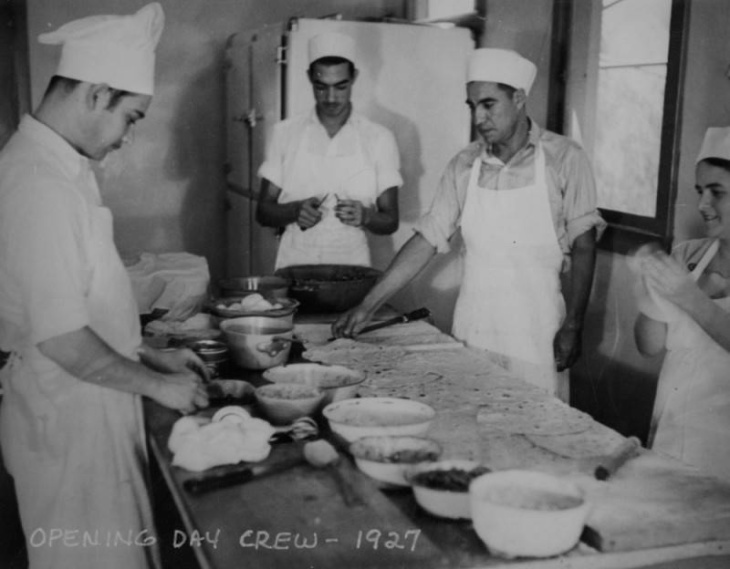 It had eight stools, three booths and a hot top stove where cooks could heat tortillas on the top while melting the cheese in the enchiladas underneath. 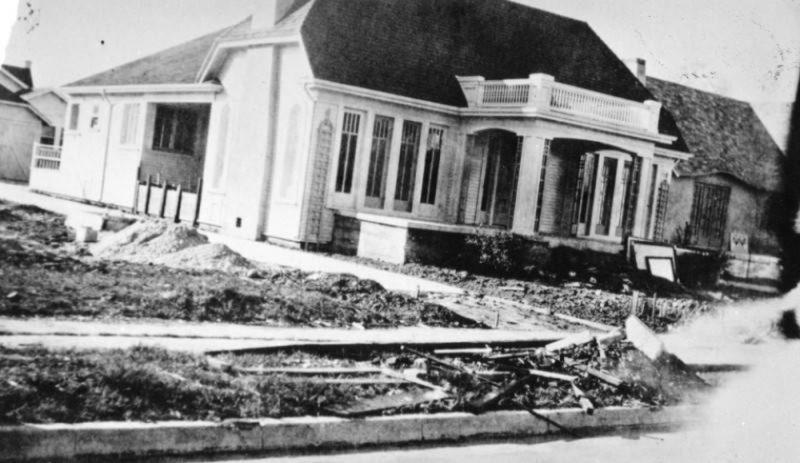 In 1931, El Cholo moved a few doors away, to a house at 1121 S. Western Ave., now known as El Cholo's original location. Back then, Mexican food was often referred to as Spanish cuisine — and El Cholo's neon sign still says "Spanish Cafe." Over the next several decades, the restaurant expanded its menu and its locations. In the '30s, El Cholo introduced its customers to the Caesar salad, a dish that originated in Tijuana. In 1955, guacamole joined the offerings as a dip for corn chips, which were becoming popular. 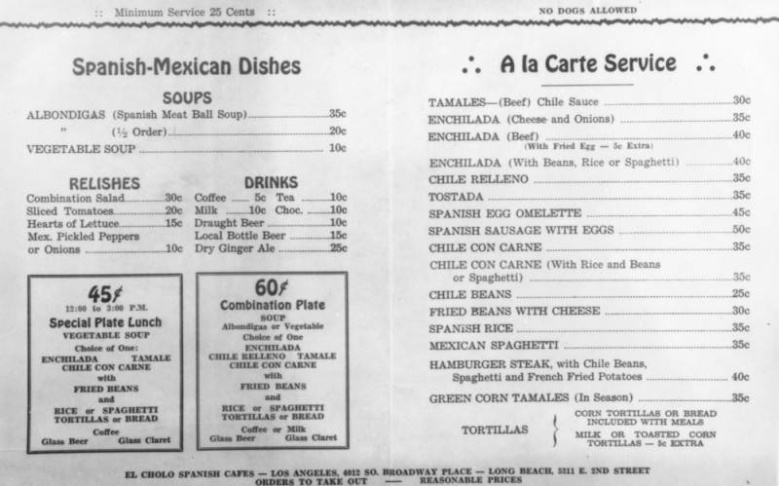 A few years later, in 1959, waitress Carmen Rocha's nachos were added to the menu. Newer additions include the chicken chimichangas (1967), the crabmeat enchilada (1971) and the blue corn chicken enchiladas (1986). Along the way, El Cholo became an institution, a beloved destination for family gatherings and special outings. For many people who didn't grow up eating Mexican food, it was also the first restaurant where they got to try it. El Cholo introduced the palate of white America to chiles, tortillas, meatball soup and flan. From a business standpoint, it was also a groundbreaking restaurant concept that paved the way for Mexican restaurants and fast food chains like El Torito, Acapulco, Taco Bell, Del Taco, Chevys, Baja Fresh and Chipotle, to name a few. How important and influential is El Cholo? Take the green corn tamales, which date back to 1923. Available from May until September or October, they're still made fresh every year and they're also so popular that people have them shipped around the world.